BCS XI took on The Druids in Waltham for their final game of the 2010 BSSL season. Each team had already secured promotion to the 3rd Division, with The Druids having clinched first place and BCS XI second, so this game didn't mean much on paper. But, it provided an opportunity for the best two clubs in the 4th Division to display some classy soccer and to end the season with a victory. The match didn't lack action or excitement, with six goals and a red card resulting in a 4-2 BCS XI victory. The quality of the sides was evident from the kick-off, with both teams confident on the ball and strong in possession. The Druids had a couple early giveaways in the back which led to half-chances, but BCS was unable to capitalize. The Druids repeatedly attacked with long-balls and by swinging in crosses from out wide, but the BCS defense repeatedly cleared the danger. Unable to break through from live play, Druids struck first on a corner kick, with their attacker rising highest at the far post to head back across goal into the side netting. Down a goal, it didn't take BCS XI long to even things up. Solid build-up play earned a corner, which Joe took and swung over the keeper's head. It struck the far post and Matt played the rebound across goal, where Darren was on hand to head home the equalizer from close range. With the game tied again, Druids continued to press, and soon re-gained their lead with a shot from the top of the 18, just beating stand-in keeper Ye. Yet again BCS XI responded with an equalizer. Druids were penalized for their goalie handling a back-pass after a scramble in the box. The call was much disputed by the Druid players and it really could have gone either way. After the referee got things in order, Darren tapped the indirect free-kick to Joe, who expertly picked his target to shoot low through the legs of the onrushing defenders. The rest of the half was scoreless, so the sides went into the half tied 2-2. The Druids had most of the possession in the second half, but they were unable to find the net. Struggling to pick apart the defense, they settled for shots from distance. Ye made several great saves, but the majority of shots were well off target. 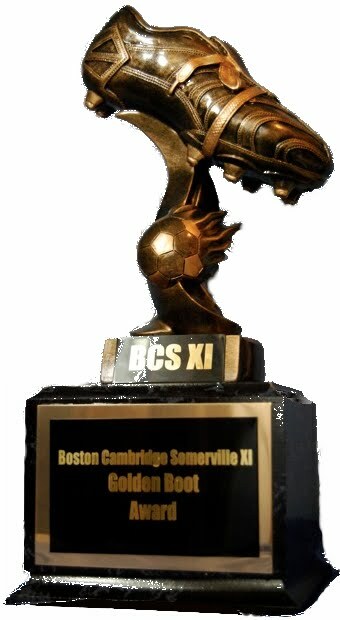 BCS XI, on the other hand, made the most of their opportunities. Joe took a free kick which rebounded high off the wall and came down awkwardly for the Druids keeper. He kept the shot out of goal but pushed it right to Adam, who finished from close range to score the winner and his first goal of the season. Adam was then involved in an incident which saw a Druids player sent off for a blatant, violent shove, directly in front of the referee. This being the Druids' third red card of the season, and second against BCS XI, the action cost them a three-point deduction in the table. But, even with ten men, Druids continued to push hard, and it was clear a one-goal lead wasn't safe. Fortunately, Chika did well to earn himself a breakaway, which he finished to seal the game at 4-2 with about 5 minutes left before being dragged off the field due to cramp. Credit to both teams for playing one of the highest quality and most entertaining matches the 4th Division has seen this year. Each team demonstrated the quality that has led to their promotion, and they look forward to meeting each other again next year in the 3rd Division.